- It must be capable of storing an average of 1TB of data for each user. - It must support sharing of data between all Windows Azure instances. - It must provide random read/write access. A recent fire near the datacenter that Trey Research uses raises the management team's awareness of the vulnerability of hosting all of the company's websites and data at any single location. The management team is concerned about protecting its data from loss as a result of a disaster. - Move all customer-facing data to the cloud. - Web servers should be backed up to geographically separate locations, If one website becomes unavailable, customers should automatically be routed to websites that are still operational. - Data must be available regardless of the operational status of any particular website. - The HRApp system must remain on-premises and must be backed up. - The Met ricsTrac king data must be replicated so that it is locally available to all Trey Research offices. - Both internal and external consumers should be able to access research results. - Internal users should be able to access data by using their existing company credentials without requiring multiple logins. - Consumers should be able to access the service by using their Microsoft credentials. - Applications written to access the data must be authenticated. Access and activity must be monitored and audited. - Ensure the security and integrity of the data collected from the worldwide distribution points for the distribution tracking application. - Provide real-time analysis of distribution tracking data by geographic location. - Collect and store large datasets in real-time data for customer use. - Locate the distribution tracking data as close to the central office as possible to improve bandwidth. - Co-locate the distribution tracking data as close to the customer as possible based on the customer's location. - Distribution tracking data must be stored in the JSON format and indexed by metadata that is stored in a SQL Server database. - Data in the cloud must be stored in geographically separate locations, but kept with the same political boundaries. - Deploy all websites to Azure. - Replace on-premises and third-party physical server clusters with cloud-based solutions. - Optimize the speed for retrieving exiting JSON objects that contain the distribution tracking data. - Use Active Directory for internal and external authentication. - Use OAuth for application authentication. - Data must be backed up to separate geographic locations. - Web servers must run concurrent versions of all websites in distinct geographic locations. 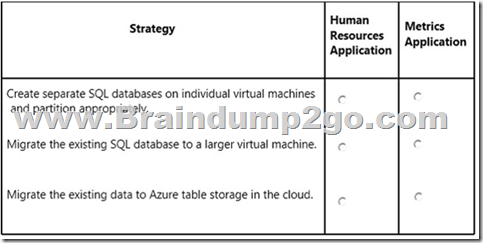 - Use Azure to back up the on-premises MetricsTracking data. 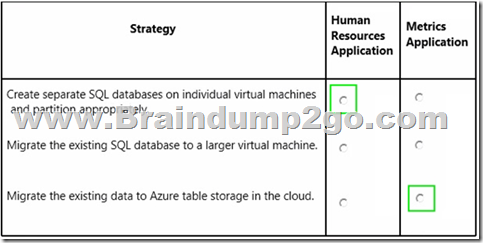 - Use Azure virtual machines as a recovery platform for MetricsTracking and HRApp. - Ensure that there is at least one additional on-premises recovery environment for the HRApp.